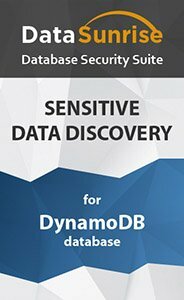 If you’re looking for a solution that will ensure sensitive data privacy of your Amazon DynamoDB databases, then you’re looking for DataSunrise database protection tools. DataSunrise suite has a comprehensive built-in Sensitive Data Discovery component. Finding sensitive data in your Amazon DynamoDB is an easy and highly adjustable process now. You will be able to find all sensitive information and protect it properly. Databases usually contain a lot of various information. Sometimes it’s not easy to separate really important and sensitive information from other types of information. The most reliable and accurate mechanism to do sensitive data search is to use DataSunrise Sensitive Data Discovery tool. This tool effectively controls all processes with sensitive data in your Amazon DynamoDB databases. Sensitive data discovery might be used during development, testing and other steps of a database life. After finding sensitive data you can apply the Audit, Masking and Security features to make sensitive data inaccessible for unwanted users. In order to find sensitive data you want protected you just need to enable the preset filters which will do everything else. Specify the database where you want the search to be done. Specify the schema where you want the search to be done. Specify the table where you want the search to be done. And, of course, you can also customize your search. As it was mentioned earlier, you can apply Security, Audit and Masking Rules to the retrieved data. DataSunrise Sensitive Data Discovery is the 1st step to be compliant with HIPAA, PSI DSS, GDPR, SOX, ISO27001.